Who said that we just use excavators and bulldozers to tear down buildings? We love explosions just as much as you do! This Houston demolition company is certified and in a position to demolish huge commercial buildings (much like the photo above) through the implosion method. Getting approved for an implosion project can be a tedious and tough process, however we are well informed and got a lot of experience in our tool belt to make things go faster with approvals from local government. A successful implosion project needs to be safe, precise and affordable. We hire the best engineers and explosive's professionals in the nation, so being successful and safe is our top priority and objection. 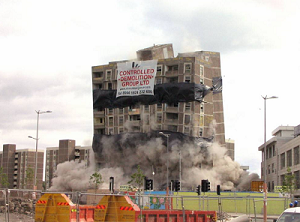 Houston Demolition Pros is Texas's greatest option to any implosion project needed to be done. Give us a call today, to get a free inspection and estimate on the demolition of your building.